Now that Windows Phone 7 has launched in the UK and Europe, and on Nov 8th in the US, it’s time to update you all on our London Travel project, what’s available right now, and what’s to come in the future. A few months back, as launch details started being released for the new Windows Phones, Me, Michael and Levente began to realise our app idea was a bit too ambitious to have ready for launch, so we had to give some thought to what we should do. None of us wanted to compromise the original idea, so we decided to develop two apps instead of the one. This would enable us to have an app ready for launch, and to have a presence on the Windows Phone App Marketplace, allowing us the time we need to complete development on our fully featured app. It was for this reason we made the decision to offer the simplifyed version for free, and to focus development efforts on having this free app ready. An added benefit with this, is the ability to recieve feedback on some of the UI elements, and more technical aspects of our app, which we could use to help improve the other app. One of the issues we came up against, is the unreliable nature of the Transport for London’s data services, which resulted in us having to completely re-write our web service which handles the transfer and formatting of the data from TfL, to our app. We also took the opportunity to implement Push Notifications in both the free and pro apps, for services chosen by the user. 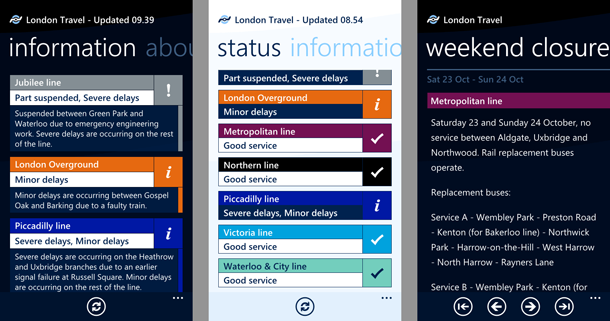 I also have been talking to some people at TfL to ensure our app complies with all the requirements set out by their interlectual property team, and as such we have made a number of tweaks which I believe has greatly improved the look and functionality of the app, as well as ensured that we will have no problems in the future with complience – a problem many other apps for other platforms may find themselves experiencing, once TfL begin taking legal action. So there we have it… Work continues, and if you can’t wait, we have a free app for you to use until we can deliver our pride and joy. 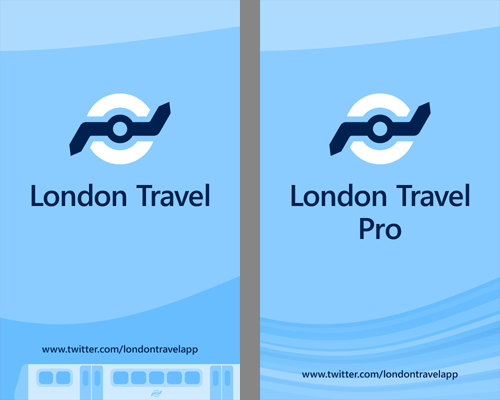 We will be tweeting progress as we complete various parts of it, and if you have any feedback, problems, criticism or praise, please tweet us @londontravelapp. this looks great, i will be downloading the free version very shortly! I personally have only had experience with Microsoft’s development tools, so am not even sure how I would be able to bring the app to iOS and Android, but it is something I would like to do in the future, if this app proves popular when we release the first version of the Pro app, wih all the lovely features! I think this is a great idea. The app looks brilliantly designed, and looks official. 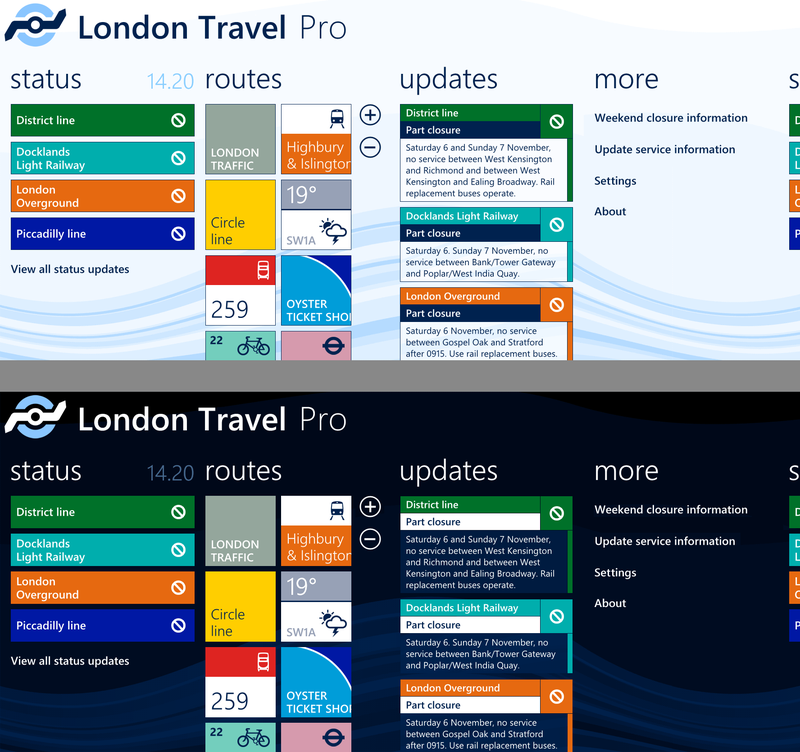 It also shows how the Windows Phone 7 UI style really does just work very well when it comes to certain apps. However, will you be planning to extend your work to other mobile platforms, the most obvious being iOS and Android? It does look like a great app – could do with one like this for the Metro up in Newcastle, will give this a go if I’m ever in London again!